“Clean, Old-Fashioned Hate.” Let’s take this one all the way back to 1917, with one of my favorite Georgia-Georgia Tech stories told to me by one of the greatest storytellers ever, Loran Smith, paraphrased and told not nearly as well as he did, of course. During World War I, many schools, including Georgia, lost nearly all of their male students to the war and most of UGA’s students-turned-soldiers left to fight in France. Subsequently, Georgia canceled football for the 1917 and 1918 seasons, not only because many of the athletes were fighting in the war, but also to show solidarity to them. Georgia Tech, however, chose to become a military training ground of sorts and thus had plenty of new athletes ready to play. Tech continued to play football during those seasons, reveling in and counting victories against the remaining teams who chose to play. 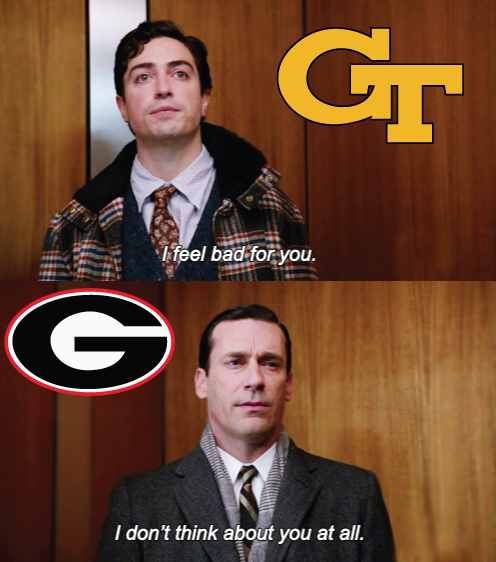 In the mighty words of Larry Munson, “Hunker it down one more time!” Let’s finish this season by adding to our glorious 12 of 13 winning record over Tech. 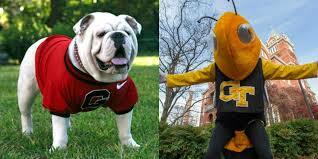 UGA vs. Georgia Tech 2014 airs on the SEC Network at 12 p.m. (noon) on Saturday, Nov. 29. Finish the fight! Finish The Fight from Georgia Football on Vimeo.